You never said thank you for The Nerd’s Watch, and you’ll never have to. Batman Begins is coming to Netflix. Below you’ll find what we deem to be the best sci-fi and fantasy movies and TV coming to Netflix, Amazon, and Hulu in August. The underrated Golden Compass is coming to Netflix. 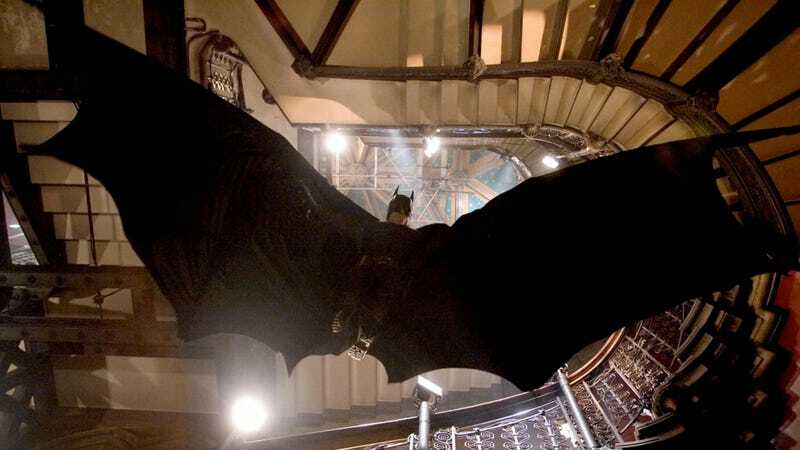 Batman Begins - Christopher Nolan’s first Batman movie is one of the most influential films in the entire genre. Plus, for my money, it’s the best of the trilogy too. Constantine - We may have a more accurate version of the Vertigo/DC Comics character on the small screen these days but Keanu Reeves stars as John Constantine in this comic book adaptation that’s fairly polarizing among fans. Polarizing enough that it’s more than worth a watch now that it’s on Netflix. Dreamcatcher - A star-studded adaptation of a Stephen King novel from an iconic director. What could go wrong, right? Well, everything. The movie is pretty bad but also a highly entertaining watch to see the wheels come off with such an incredible team. Switched - To be honest, Netflix doesn’t have a ton of great sci-fi/fantasy this month, so we’re going to take a swing on a few original shows/movies we haven’t seen. First up, Switched, about a high school girl whose envious classmate steals her body and ruins her life. The Golden Compass - Based on the first novel in Philip Pullman’s His Dark Materials trilogy, this adaptation was largely considered a failure. But give it a shot. It’s got a great cast, decent effects, and will make you wish Warner Bros. had moved forward with the rest of this excellent franchise. The Lord of the Rings: The Fellowship of the Ring - I could spend 10,000 words and not capture the magic that is this first installment in Peter Jackson’s already legendary Lord of the Rings trilogy. But instead, I’ll just leave it at that. Voltron: Legendary Defender: Season 7 - Think fans are excited for the return of Voltron? Yup, they are. This season will see the Paladins finally heading back to Earth. Disenchantment - The new animated series from Simpsons creator Matt Groening comes with high expectations and “hard-drinking princess” with her own elf and demon companion. Check out the trailer we saw at Comic-Con. Ghoul - Another Netflix original about a military interrogator who goes to on a covert mission where he has to get information out of alien terrorists. Alien. Terrorists. The Innocents - We haven’t seen this Netflix original either but the description is very interesting. “When a teenage couple runs away to be together, the extraordinary gift they possess unleashes powerful forces intent on dividing them forever.” Oooooo. The Good Place: Season 2 - Holy fork. Now you can catch up with all of the genius NBC sitcom about a month before the third season premieres on September 27. The original Terminator is coming to Hulu. It wants your boots, clothes, and motorcycle. (Yes we know that’s T2). Babe - This Best Picture nominee about a talking pig is, simply put, one of the most delightful films of the ‘90s. Hell, maybe even longer. You’ve got to see (or revisit) it either way. Black Mask - Jet Li stars in this action-packed, Hong Kong superhero martial arts film about a man who tries to live a normal life, but is forced to use his military-imposed superpowers to stop his fellow super soldiers. Halloween H20: 20 Years Later - Though this is probably one of the worst Halloween sequels, we’re putting it on this list just a fun piece of trivia to watch before the new sequel, which also stars Jamie Lee Curtis and pretends like this movie doesn’t exist. But it does exist. Jacob’s Ladder - This Tim Robbins-starring psychological horror-thriller is widely regarded to be one of the best films in that genre. It’s weird, scary, and wonderful. Point Break - Okay, so Point Break isn’t sci-fi or fantasy. But it’s so much fun and so over the top with its action and set pieces that, maybe, it qualifies as impossible and fantastic. Shaun of the Dead - Edgar Wright’s romantic comedy with zombies starring Simon Pegg and Nick Frost remains a fan favorite. One that, eventually, will rise to all-time great status. Now you can just watch it again and again. The Terminator - The James Cameron original Terminator remains one of those films you simply have to see. It still holds up incredibly well, both as an awesome movie, and a key piece of sci-fi history. The regular cut of Watchman is coming to Amazon. The Blair Witch Project and Book of Shadows: Blair Witch 2 - The first film is one of the landmark films of all time. The second is its sequel. But both are worth watching for the creepy mythology they develop, along with the scares and cultural impact. Frequency - Dennis Quaid and Jim Caviezel in this underrated, emotional, time travel movie about a son who talks to his dead father through a radio. Watchmen - Zack Snyder’s faithful adaptation of the legendary comic series comes to streaming in, what we can only assume is, its theatrical cut. There is actually an extended cut of this one too, which is better, but the theatrical cut is solid, even if just for the amazing opening credits and impressive visuals. Spy Kids 2: Island of Lost Dreams - Most of the Spy Kids films are fun for the whole family, even though they’re largely frivolous. That includes this sequel, which randomly comes to Amazon this month.